Come garden with us in Volunteer Park! We will be weeding, edging, mulching, and cleaning garden beds among other gardening tasks to make Volunteer Park more beautiful! Meet at the SE entrance to the park at 15th Ave E & E Prospect St at 10AM on Sunday, September 16. Gloves and tools will be provided, or bring your own. 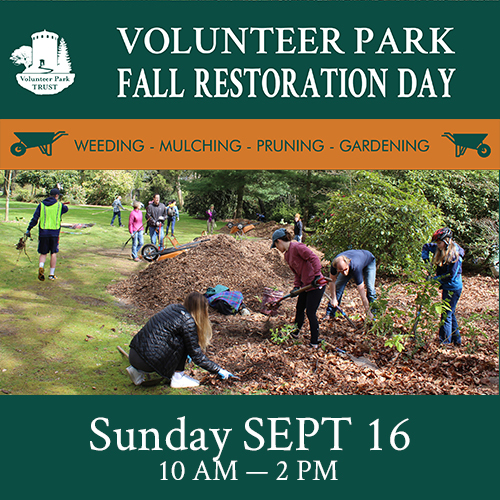 Stay for the whole event or as long as you want to help continue our restoration efforts and make Volunteer Park a more beautiful place for everyone. Everyone from toddlers to seniors are welcome. Please bring friends and kids! No gardening experience necessary. This gathering is a wonderful way to meet neighbors, help our lovely park and learn more about Volunteer Park Trust. We'll also have FREE donuts provided by Mighty-O Donuts and FREE coffee provided by Aegis Living on Madison. THANK YOU to our Community Partners: Kaiser Permanente and 4Culture . Thanks also to our Event Sponsor: BECU.